Our Ninabrook store travels with us to most of our events and retreats. This means that if you can't attend you can still come and shop with us. We will post details of upcoming events here. We will also post an event coupon code for pre-orders. One advantage of this code is that when you enter this code in the coupon field of your online order, all you have to do is come to the event/retreat and pick up your order and you save the shipping! If you live in the area make sure you drop in to one of our VIP Events, and say 'hello'. There's always something kooky going on. Check back here often for events and pre-order details!! Join our email list to be invited to our monthly VIP Warehouse events. If you live in and around Ajax or happen to be passing through, drop in to our warehouse for some shopping, a chat, refreshment and some baked goods. 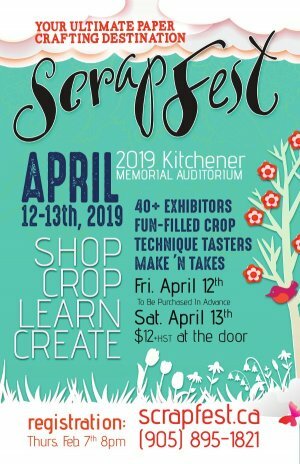 Join us at Scrapfest this April 12 & 13, 2019. Our famous deals on 60-packs of American Crafts' Cardstock and Scrapbook Adhesive's duo tape runner will be waiting for you. A fun 15-hour crop is coming to Ajax. Ninabrook Paper Crafting will be the onsite store. You will love this surprise!! Check the Calendar of Our Events for more information as it becomes available.